Are tree frogs poisonous? In addition to questions such as what type of tree frog is this, the toxicity of tree frogs is one of the very common questions people ask. Interpreting the question and providing an adequate answer can be a challenge. Are Tree frogs poisonous? Do you mean, is my dog going to get sick because it ate the tree frog in the back yard? The short answer is probably. Tree Frogs, frogs and toads have toxins on their skin to ward off predators. Dogs can get a stomach ache and/or vomit after ingesting a tree frog. Are tree frogs poisonous to the point of killing my dog? The short answer is no. The longer answer is no, and think about it with only common sense. If dogs died from eating tree frogs, there would be daily reports of mysteriously dying dogs all over the United States. The longer answer is, despite the assurances of pet safety, there is always an exception or two to the rule. For example, the Cane Toad, or Giant Toad (Rhinella marina) is an invasive species that is spreading across the southern areas of the United States. A total of 90 canine cases of suspected toad poisoning were reviewed. Small breed dogs accounted for 76% of cases. Jack Russell, Silky, and Fox Terriers were the most represented breeds. Cases were reported year round, with fewest cases over the winter months. The most common clinical signs were increased salivation (78% of cases), and red oral mucous membranes (63% cases). Seizures occurred in 31% of cases. Generally the outcome was excellent with 96% survival. Generally speaking, is it never a pleasant experience for a dog to get sick from an encounter with any frog. While it may be in the dog’s nature to chase squirrels and frogs in the yard, discouraging the activity helps keep the family pet healthy in the long term. Now, if the question, Are tree frogs poisonous? is referring to the colorful frogs that people often see when they visit zoos, the short answer also has to be no. neither of them belong to the formal tree frog family. However, members of these poisonous frog families are generally small like tree frogs and actually live in trees and bushes. Dendrobatidae, new world, neotropical frogs, inhabit tropical forests of Central and South America. Small in size, the nickname name poison dart frog came from the fact that indigenous peoples were known to use their poison on blow gun darts for hunting. The pictures on this page are all Dendrobatidae species. The top picture is the Strawberry Poison-dart Frog. It looks delicious. Of course any family that keeps these species as pets would need to keep them safe from the other family pets. 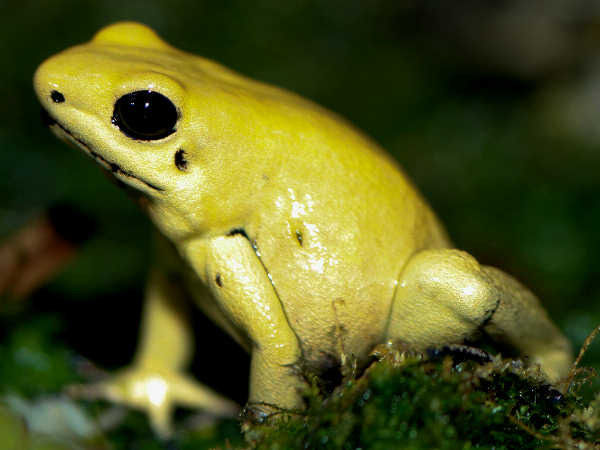 The most toxic species of any frog is Phyllobates terribilis, which produces batrachotoxins and homobatrachoxins at a level approximately 20-fold that of other dart-poison frogs. In addition to their small size, many Mantella and Dendrobatidae species are colorful, a reminder to potential predators in their territory to stay away. The third picture shows a poison dart frog. Partly because of their toxicity, they are active during the day, hunting insects, their food of choice. 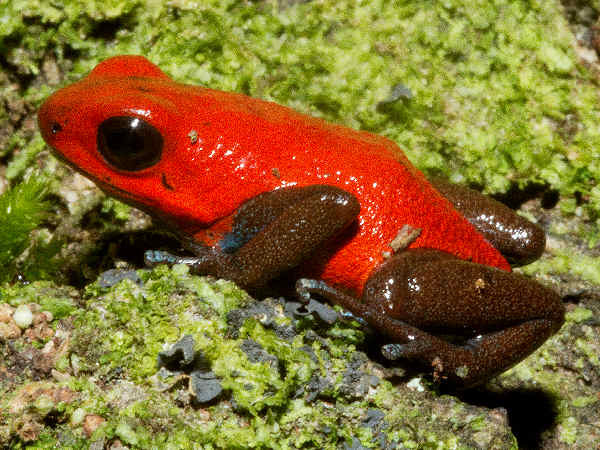 In fact, recent research from the National Academy of Sciences, Convergent evolution of chemical defense in poison frogs and arthropod prey between Madagascar and the Neotropics found that the frogs’ poisonous alkaloids result directly from their diet. They consume poisonous insects, often ants and millipedes, and the poison accumulates in their skin. Because the poisonous alkaloids are not naturally occurring, many poison frog species are raised as pets. 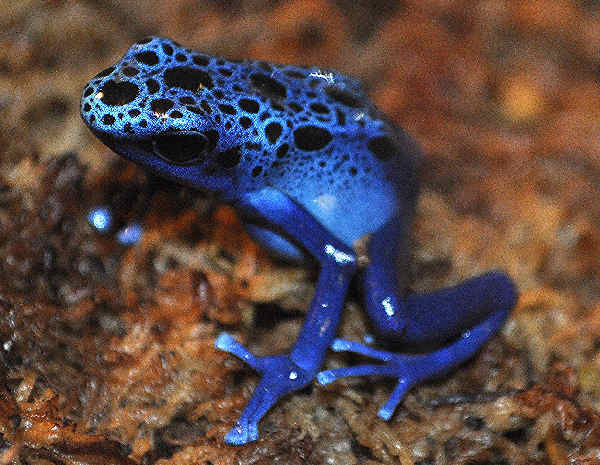 After a time, feeding captive bred poison frogs non-poisonous insects, creates non-poisonous, poison frogs. Currently the IUCN lists one hundred and fifty seven Dendrobatidae species arranged according to eleven genera. Close to thirty are listed as either endangered or critically endangered. However, that number could be substantially higher due to the lack of data available on all of the species. Seven of the sixteen Mantella species are listed as either endangered or critically endangered.